Nursing is typically understood, and understands itself, as a care-giving occupation. It is through its relationships with patients – whether these are absent, present, good, bad or indifferent – that modern day nursing is defined. Yet nursing work extends far beyond direct patient care activities. Across the spectrum of locales in which they are employed, nurses, in numerous ways, support and sustain the delivery and organisation of health services. In recent history, however, this wider work has generally been regarded as at best an adjunct to the core nursing function, and at worse responsible for taking nurses away from their ‘real work’ with patients. Beyond its identity as the ‘other’ to care-giving, little is known about this element of nursing practice. 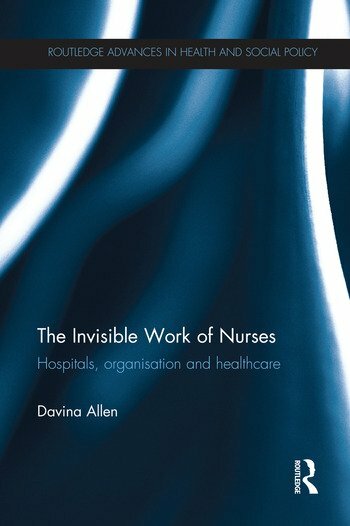 Drawing on extensive observational research of the everyday work in a UK hospital, and insights from practice-based approaches and actor network theory, the aim of this book is to lay the empirical and theoretical foundations for a reappraisal of the nursing contribution to society by shining a light on this invisible aspect of nurses’ work. Nurses, it is argued, can be understood as focal actors in health systems and through myriad processes of ‘translational mobilisation’ sustain the networks through which care is organised. Not only is this work an essential driver of action, it also operates as a powerful countervailing force to the centrifugal tendencies inherent in healthcare organisations which, for all their gloss of order and rationality, are in reality very loose arrangements. The Invisible Work of Nurses will be interest to academics and students across a number of fields, including nursing, medical sociology, organisational studies, health management, science and technology studies, and improvement science. Davina Allen is Professor of Health Service Delivery at Cardiff University, UK. She is Deputy Editor-in-Chief of Sociology of Health and Illness.